Florida Trend is an award-winning business magazine read by 250,000 senior business executives, civic leaders and government officials each month. Delivered via print, tablet, mobile and e-newsletter, Florida Trend covers business news, executives, industry analysis, regional news round-ups and executive lifestyle. The foundation on which the vision of the Bit-Wizards culture is built is on the principle of doing what is right for our community. The community of Bit-Wizards extends from employees to families, to local and national customers and vendors. 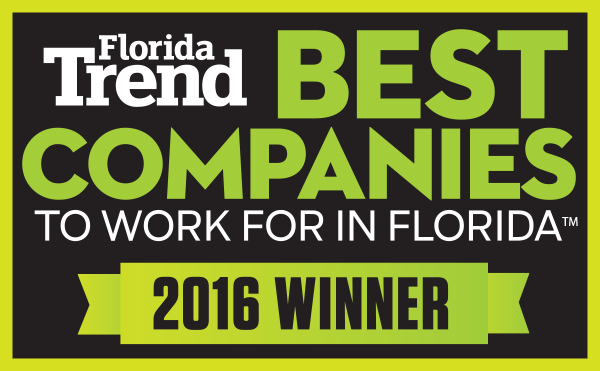 "It is such an honor to be recognized as one of Florida’s Best Companies to Work For. Our focus is on providing exceptional benefits, and developing programs and events which engage our Wizards in collaboration, professional development, and our overall culture of fun! We are truly blessed to have such a dynamic team that helps us create an environment in which we sincerely call Bit-Wizards one of the best places to work in Florida!" says Bit-Wizards Director of Human Resources, Mallory Whalen. Customers touched by the Bit-Wizards magic instantly realize they have come in contact with people that are talented, driven, and generous in so many ways. For the six consecutive years the Bit-Wizards team has been ranked on Florida Trend's Best Companies to Work For List, and this year is no different. This year, Bit-Wizards is proud to be ranked fifth on the list in the Small Business Category, and we could not be more thrilled! Bit-Wizards (http://www.BitWizards.com) is an innovative, award-winning technology company with offices in Fort Walton Beach, Florida, Memphis, Tennessee, and Austin, Texas. A Kentico Gold Partner and a managed Microsoft Gold Partner, Bit-Wizards fills the need of any business seeking to develop an application, build a brand, or move to the cloud. Customers of Bit-Wizards know that their project is kept in-house with our Wizards and that we never outsource a project. Florida Trend is an award-winning business magazine read by 250,000 senior business executives, civic leaders and government officials each month. Delivered via print, tablet, mobile and enewsletter, Florida Trend covers business news, executives, industry analysis, regional news round-ups and executive lifestyle. For more information, visit http://www.FloridaTrend.com. Best Companies Group works with partners worldwide to establish and manage “Best Places to Work,” “Best Companies” and “Best Employers” programs. Through its thorough workplace assessment, utilizing employer questionnaires and employee-satisfaction surveys, BCG identifies and recognizes companies that have been successful in creating and maintaining workplace excellence. For more information, visit http://www.BestCompaniesGroup.com.